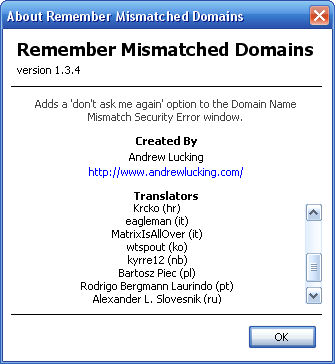 While version 1.3.4 of the Remember Mismatched Domains extension doesn’t solve the linux problem, Seamonkey users will be happy to hear that they can once again join in the mismatched domain remembering fun. There are also a bunch of new localizations included in this release – thanks to everyone who submitted translations. It’s been awhile since RMD has been updated so if I’ve messed anything up could you let me know in the comments. Thunderbird 3 you say? Would you happen to know if the TB 2 nightlies (Windows) are affected? update: I did some checking and RMD seems fine in today’s TB 2 nightly (on Windows). All kinds of problems with TB3 though. I think I’ll give it some time to stabilize a bit before trying to troubleshoot… Are you actually getting work done with that build Jeff? I have been using it a bit now and then. A bit back I periodically updated to the latest TB 3 build so that I could test the latest Lightning build. I had RMD 1.2.8 and pushed through the flash of a popup that grabbed focus. I used TB 3 as my defalt email prorgam for a good 2 or 3 months. (I’m a glutton for punishment) Then I switched away. Just recently I tried the current TB 3 build out again to see where things were at. I’ve used this extension for ages without any problem. Recently, I’ve noticed that Thunderbird reports a mismatched domain every time I send mail. I check the box to remember the mismatch, the server gets added to the list and the next time, I get the error report. Checking the remembered Domain Name Pairs, I see duplicates for my smtp server. Just thought you might want to know. I noticed that the Mozilla extension page has someone reporting a similar problem. Thanks Tony, I’ll look into it on the weekend. My first thought is to maybe try uninstalling and then reinstall RMD (restarting TB in between). I had the same problem as Ernst. When I loekod at the html file thunderbird created after I followed the instructions, I saw that the source directory path had been changed to include %20 in place of the spaces. I believe this is the problem that many of you are facing. If you prefer to use the html in the account settings window I believe this should resolve the problem. For example:file://C:/My Pictures/My Logo File.jpgchanges tofile://C:/My%20Pictures/My%20Logo%20File.jpgThose of you that use a language that uses accents and non-english characters in the path and filename might have other problems.